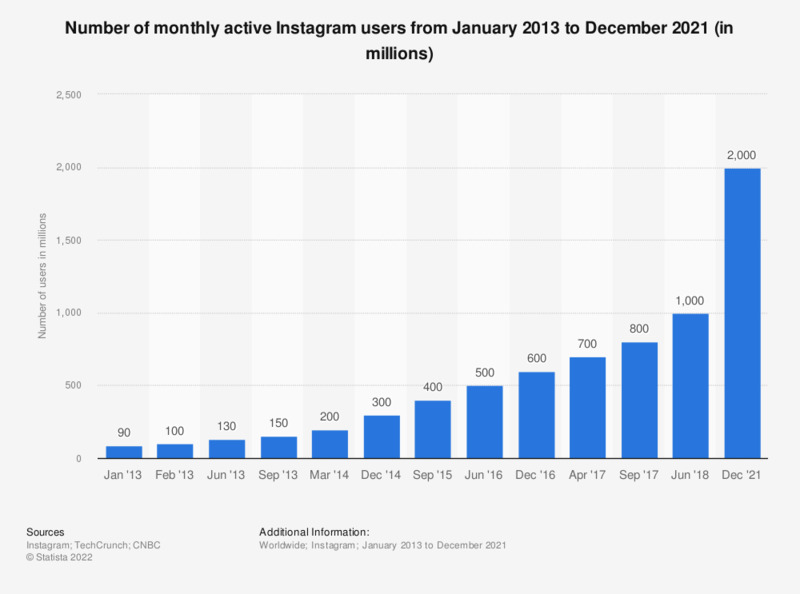 This statistic gives information on the number of monthly active Instagram users as of June 2018. As of that month, the mainly mobile photo sharing network had reached 1 billion monthly active users, up from 800 million in September 2017. The app is one of the most popular social networks worldwide. Instagram is a mobile social network that allows users to edit and share photos as well as videos. In 2015, there were approximately more than 77.6 million active Instagram users in the United States. This figure is projected to surpass 111 million in 2019. Instagram is most popular with teens and young Millennials – this holds true in the United States where more than half of Instagram’s user base is between 18 and 29 years old. Globally speaking, 41 percent of users are 24 years of age or younger. Instagram is the preferred social network of teens in the United States, beating out Twitter and Facebook. Due to the apps visual nature and high user engagement rate, Instagram is also a valuable social media marketing tool. As of March 2016, 98 percent of fashion brands had an Instagram profile. As of December 2016, average number of image brand posts on Instagram was 27.9 posts per month.